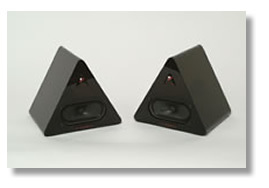 Triple P Designs' "Pyramid" studio monitors help prepare any studio for the outside world. While your mix may sound great on your monitors in your studio, it must also sound great outside your studio walls. Whether your mix ends up on a tiny television, car stereo, boombox, or any other non hi-fidelity system, the outside world has billions of systems that don't sound as great as yours. Your mix needs to translate well. As a mixer you need to have the confidence that your mixes will translate well in the real world. 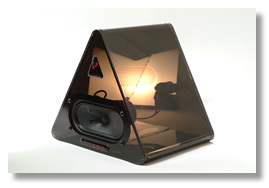 The Pyramid monitors allow mixers to hear the effects of non hi-fidelity playback systems while they are mixing, and while they still have the opportunity to compensate. Any great mixer will tell you a great mix needs to sound great on any number of speakers. "Every Studio Needs a pair of really great sounding speakers, and a great pair of REAL sounding speakers"